Mumbai, March 9: Former United Nations Secretary General Ban Ki-moon, former British Prime Minister Tony Blair and his wife Cherie Blair, Google CEO Sundar Pichai, Microsoft CEO Satya Nadella and a host of politicians and film personalities graced Akash Ambani and Shloka Mehta’s grand wedding here on Saturday. Bollywood celebrities Shah Rukh Khan, Ranbir Kapoor, Ayan Mukerji and Karan Johar, as well as cricketer Hardik Pandya danced away to singer Mika Singh’s live tracks as industrialist Mukesh Ambani’s son Akash made his way to wed his childhood friend Shloka, the daughter of Mona and Russell Mehta. 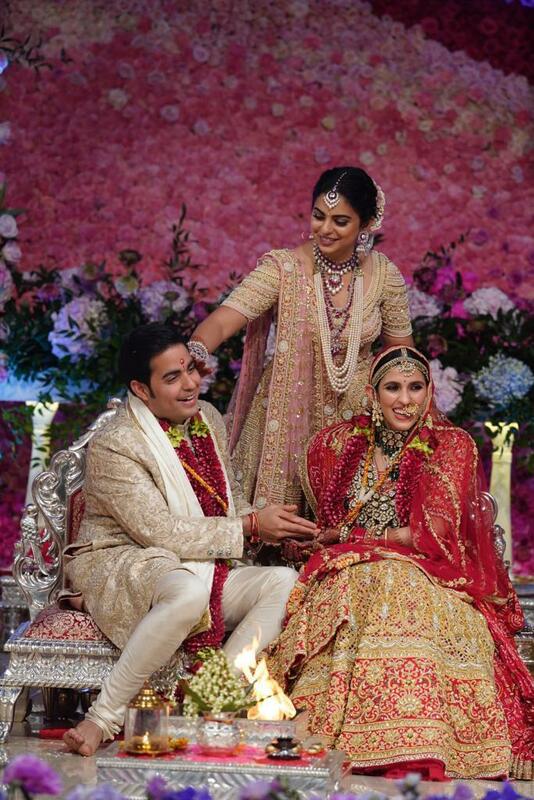 The celebrities joined the lively and colourful “baraat”, which also saw the groom’s parents — Mukesh and Nita Ambani — and sister Isha Ambani groove. The groom looked dapper in a soft pink, intricately embroidered and sequinned sherwani, while the bride chose a traditional red for the D-Day. 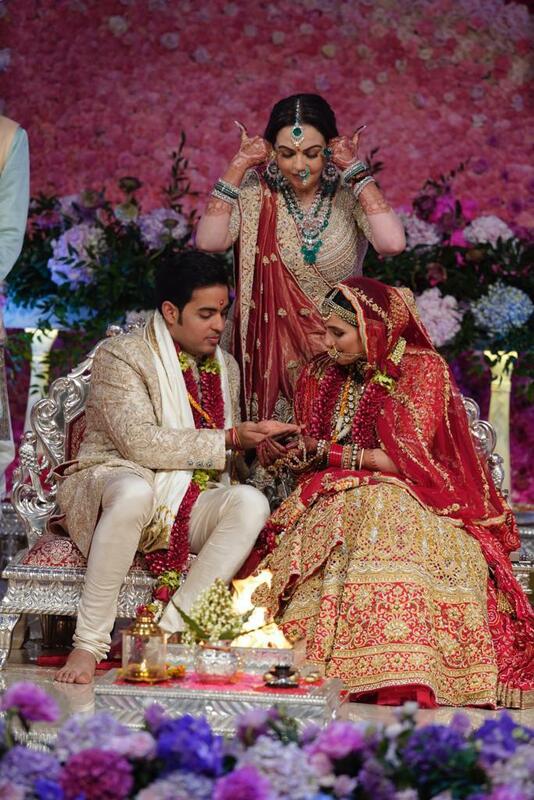 Akash kickstarted the wedding festivities by offering prayers to his paternal grandfather, late Dhirubhai Ambani, and maternal grandfather, late Ravindrabhai Dalal. The wedding venue — Jio World Centre in Bandra-Kurla Complex — was decked up with elaborate floral arrangements set according to a garden theme, complete with a faux waterfall, floral figurines, a fountain and a grand stage with a huge Krishna idol done up with flowers. Live music added to the festivities at the wedding gala, which saw the Who’s Who of the cinema, political, business and sports world. Isha and her husband Anand Piramal, along with Piramal Group Chairman Ajay Piramal and his wife Swati, were part of the celebrations. Others from the business sector included Anil Ambani, Ratan Tata, Lakshmi Niwas Mittal and Usha Mittal, Anand Mahindra and Gautam Singhania. Google CEO Sundar Pichai and Microsoft head honcho Satya Nadella too came for the celebrations, as did politicians like Praful Patel and H.D. Deve Gowda. As for the film world, the Bachchan family, including Amitabh, Jaya, Shweta, Abhishek, Aishwarya and Aaradhya, were in attendance, as were Rajinikanth, Priyanka Chopra, Aamir Khan and Kiran Rao, Alia Bhatt, Karisma Kapoor, Kareena Kapoor Khan, Rajkumar Hirani, Vidhu Vinod Chopra, Anu Malik, Armaan Jain, Jackie Shroff, Vidya Balan, Vishal-Shekhar, Gauri Khan, Farah Khan, Juhi Chawla, Kiara Advani, Sidharth Malhotra and Shabana Azmi. Among the sportspersons, Sachin Tendulkar, Harbhajan Singh, Krunal Pandya, Hardik Pandya, Zaheer Khan, Ajinkya Rahane and Sri Lankan legend Mahela Jayawardene were present on the occasion. After the wedding, a celebration night will be held on Sunday, followed by a grand reception on Monday. The marriage was preceded by days of celebrations, which began with a “dandiya” night last month. A three-day extravaganza at St. Moritz in Switzerland saw The Chainsmokers and Coldplay’s Chris Martin perform to an audience full of Bollywood stars, as well as a carnival bash which was opened to the locals for two hours. The week before the wedding was also full of celebrations for the families with a Harry Potter-themed party, a musical night, a mala and mehendi function and more.